A screenshot taken from WGAL's Facebook live coverage of the groundhog near Swatara Creek. The Internet loves to rally around an animal in distress. Or maybe it's just me. I can't resist joining in with the slew of followers on Twitter that won't can't put down their phones until they know an animal has been rescued, brought to safety, or achieved the goal they were crawling toward. Today's story is a bit different, but it nonetheless showcases that underneath it all, humans want the best for other living things. So, this story is all about the pride and joy of our great state: the woodchuck, the whistle pig, Punxsutawney Phil himself, the groundhog. After all the rain, you've probably heard that areas of Pennsylvania have flooded — including Hershey Park and Knoebels, by the way. Well, Swatara Creek — a 72-mile tributary of the Susquehanna River in central eastern Pennsylvania — swelled into a river by Tuesday morning. One woman took a Facebook live video on Tuesday afternoon from Middletown and you can see the moving water racing behind her. 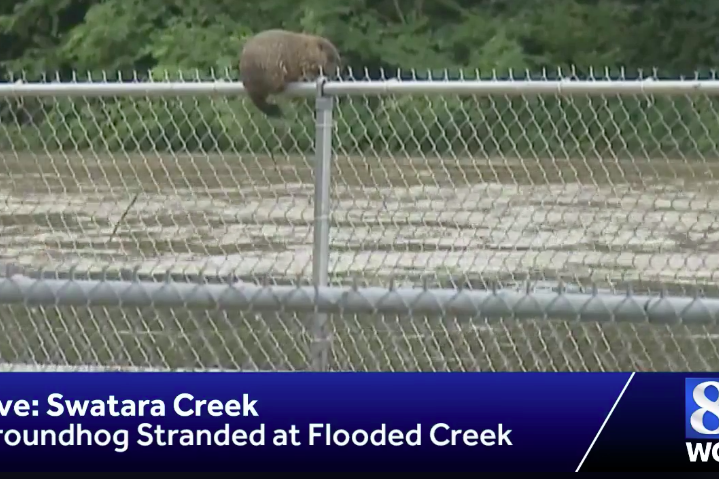 Local television stations have been covering the flooding, but this morning WGAL directed its coverage to a supposedly stranded groundhog near the Duke Street Bridge in Hummelstown during a Facebook live video. The animal was perched on a chain-link fence, just watching the water go by. People on social media and on the live video were quick to sympathize with the groundhog that appeared to be stranded. Now, the video has more than 800 comments from people offering to dive in and save the animal, begging WGAL to send someone to save it, and lots of crying emojis. "Police have advised people to stay away from the floodwaters," WGAL commented back. "They are very dangerous. One person was already swept away last night." A similar live stream from CBS in Harrisburg had to make special note that the camera was zoomed in, with a significant amount of water separating the camera from the animal, just so that viewers couldn't complain no one at the station had dove in to rescue it. People were very serious about this. Well? Picture taken. No help or update on the poor thing?? But, Internet, had you thought of this? Groundhogs can swim. Someone pointed this out on Twitter, and then Penn Live broke the news to everyone that yes, groundhogs are cooler than you thought, and do swim. Groundhogs are technically just big squirrels, and use climbing and swimming to protect themselves from predators. Here are nine other things you probably didn't know about groundhogs. So the woodchuck was probably just mustering its strength before it dove in for a swim. Or maybe it was weighing its options before plummeting into those fast waters. Regardless, he is going to be A-OK, everyone. Thank God.